Capturing landmarks, squares and cityscapes without annoying tourists: how often have you waited in front of places of interest to take a moment when you can take the photo without annoying tourists. 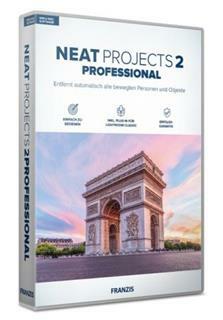 With the new NEAT projects 2 professional you can do it easily and you no longer have to wait! You will definitely be asked how you made this picture! A lot of people can walk around in front of a popular photo subject and still you will not see anyone in your photo – How does it work? They photograph your sight and just take several pictures of the scene in a row. You do not even need a tripod for this. NEAT projects 2 professional converts the series of pictures into one picture after being loaded with the once again optimized motion algorithms: Multiple exposures remove people from the picture without you having to do anything! You get a single perfect picture without the disturbing people or cars that were in front of the photo subject. + Record cities and sights without disturbing people or cars! With the technique of multiple shots of a busy city scene with cars you can free any motive – you do not even need a tripod or other aids – NEAT projects 2 professional automatically detects objects that move and removes them on the result image, lightning fast and fully automatic. For this purpose, all images are aligned by the software, pixel superimposed on each other. Afterwards, all objects that are not in the same position in all pictures are removed because they are moving. Clever, right? The question is not whether you need NEAT, but when. And you’ll NEAT projects 2 professional at some point! When the time comes, NEAT will be ready for all image files, whether JPEG, TIFF or RAW. From AdobeÂ® Lightroom directly into NEAT projects 2 professional, this is easy with the full-featured filter plug-in for AdobeÂ® Lightroom. Simply select the desired image series in Lightroom, export to NEAT projects 2 professional, edit and play back the result image! Exposure differences of the single images are automatically deducted, thus the result is again more accurate. In addition, this function can also be used to load exposure bracketing if the exposure differences between the individual images are not so great. Create and save and load your own motion fusion profiles now. With the composing module you can easily add a more beautiful sky to your scene to perfect the picture. Up to four masks are at your disposal, the creativity knows no bounds! A little tip by the way: For such scenes as the shot of St. Peter’s Square, it is worthwhile to create a small picture pool with beautiful sky shots to give a motif the finishing touch. But the composing module can do even more: You now have the option of providing individual image parts with changeable textures. The result is a completely new image impression and even more creative possibilities in the image design.